80% of the waste in the marine is plastic trash! In the ocean, 80% of the trash problem is all from plastic. Whether it is bags or bottles. Plastic breaks down into smaller pieces which not only appear as food for the organisms in the ocean but it eventually gathers up and can either trap fish in the ocean or destroy habitats. 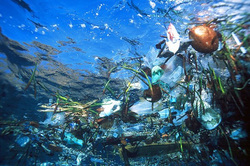 About 43% of the living organisms die due to plastic waste. It is a serious threat to life in the ocean. Unlike most trash, plastic is not biodegradable. It is photo-degradable from the sun and breaks down into smaller and smaller pieces but never really goes away. Plastic is also swept away by ocean currents, it lands in vortexes, swirling, called ocean gyres. There is in California the largest ocean garbage site in the world. 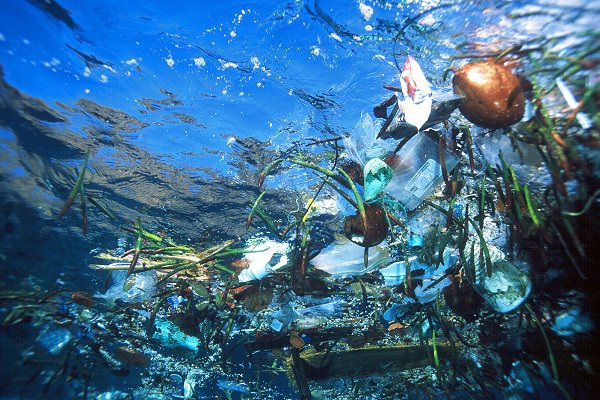 Great Pacific Garbage Patch, it has a floating mass of plastic twice the size of Texas! The amount of plastic outnumbers sea life by a measure of 6 to 1. It is almost impossible to fully clean up. Plastic is a serious threat to the health of sea creatures, both big and small. It is also unusually toxic once it enters the ocean environment. Organisms at the bottom of the food chain, such as plankton and krill, eat the chemicals from the plastic along with the microscopic plastic particles, then larger fish consumer the smaller ones and the toxins eventually make its way up the food change. - the average american will throw away about 185 pounds of plastic every year. -plastic in the ocean breaks down into such small segments that pieces of plastic from a one liter bottle could end up on every mile of beach throughout the world. - 380 billion plastic bags are used in the United States every year. Which most of them make it into the ocean water. 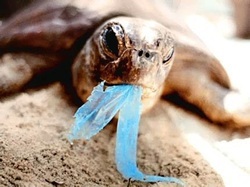 267 species around the world are harmed due to plastic. To get more information about the plastic pollution in today's ocean, and how to help, visit www.saveouroceans.com and watch the free videos!